And, I managed to steal some time from family (DD and DH are playing the saxophone he got for Christmas - noisy, but it keeps them entertained!!!) 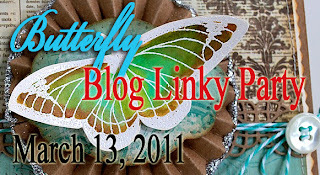 and found time to make a simple card for the butterfly blog linky party. Love these Martha Stewart butterflies, and will be using them often! Your butterflies are so pretty. Love the colors that you used and your layout! !